If you want to know where and how to eat cheap in Poland, here is a food that although is not really traditional Polish cooking, it is part of the Polish diet. Za-Pie-kan-ki literatlly means something that is baked. 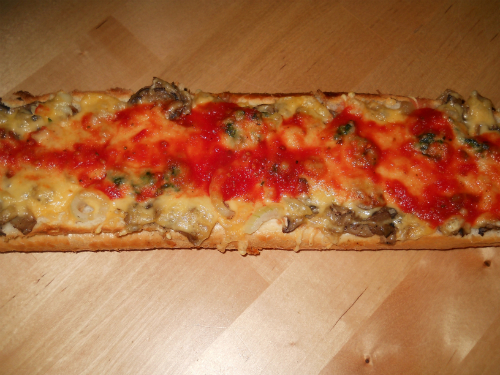 A zapiekanka is the most popular kind of fast food In Poland. No one really knows the story behind inventing it, but what I know is that it first became popular in 1970’s, during the Communism period in Poland. It is quick and extremely easy to make, even for someone who hardly knows how to make scrambled eggs. Zapiekanki are very popular among college students, as they can make a good, filling and hot meal and at the same time are relatively cheap, especially if you buy them frozen. This kind is not that great though, so if you are not a student have a real one instead. 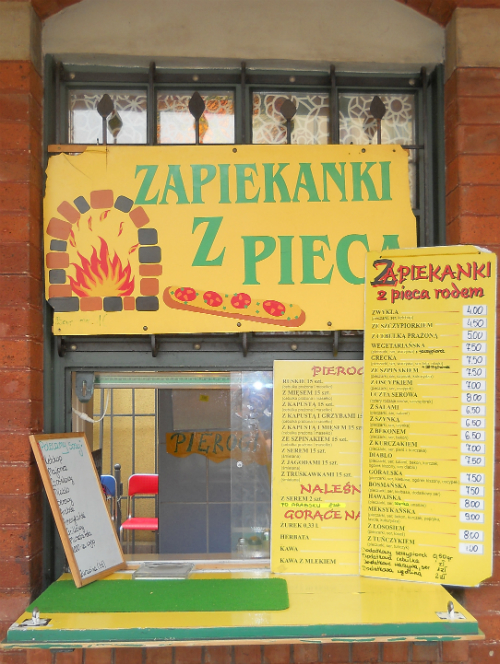 Zapiekanki is a cheap way to eat in Poland, look at the prices in Polish Złoty on the right. What actually is a zapiekanka? It’s a half of a long roll with different kind of toppings, baked in an oven and served hot. You might find it close to pizza although it rarely contains tomato sauce. The two basic ingredients that are used in a classic zapiekanka are cheese and mushrooms, but nowadays it revolved to a level where you can choose from such things as a Mexican or Greek style ones, so mushrooms are no longer a must as they do not go with everything. I like lots of vegetables on it as the base price is pretty cheap and even if you go hog wild you are talking less than 3 dollars for a substantial meal. In Krakow, found the best one in Podgorze where I live (ask me for directions). It is called the ‘red pepper pizza shop’ in English, but the one in Kazimierz is a Jewish and hipster district of Kraków are the most popular as late night pub goers get food there. Pizzeria "czerwona papryczka" is where I recommend to get a real cheap and good baguette in Krakow. The most popular toppings are mushrooms, cheese and ham, served with ketchup or garlic sauce on top. Those can be made at home easily and a lot of Polish moms use them as quick dinner replacements when they do not have time to cook a more complex meal. For a homemade one you can use a round bun or even a slice of bread, as long as it is a wheat product. Dark whole grain bread is great, but I would save it for a different occasion as it will never make a good zapiekanka. The base has to be neutral so that you can fully enjoy the fun stuff that is on top of it. Warning about this Polish food – If you eat it before you go to bed you will have so many wild flying dreams as they load it up with mushrooms. Normal Polish mushrooms but still they are powerful enough to give you crazy dreams. You will find them anywhere in Poland. By the bus stop, on the beach, in bars and football stadiums. 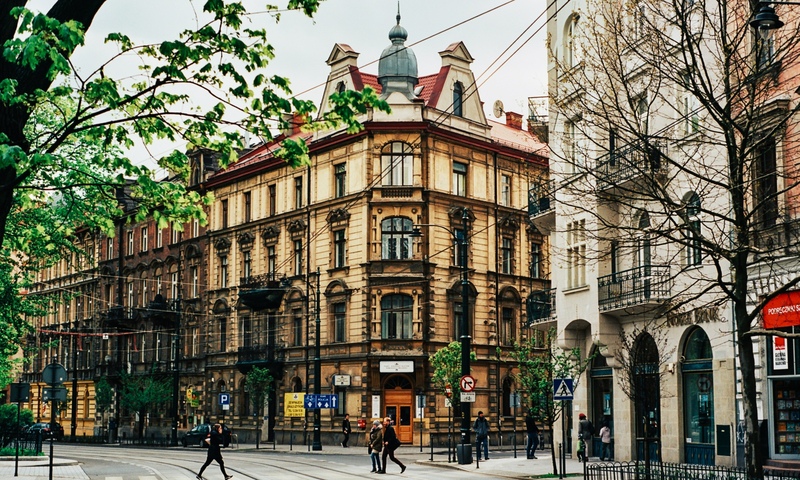 They are everywhere, but if you want the best one, come to Kazimierz – old Jewish district of Kraków. It’s famous for its zapiekanki and it is probably the only place where you can get one with feta cheese and barbecue sauce, if that is what you like. 1. Melt some butter on the frying pan, throw in sliced mushrooms and chopped onions. Add some salt and pepper and fry for 10 minutes, stirring occasionally. 2. Cut the bun horizontally in half, spread some butter on it and place the mushrooms on top using a big spoon. Then put some ham on it and cover with cheese, it can be grated or just slices. 3. Bake for about 15 minutes at 185°C (365°F) until the bun is crispy and the cheese is well melted and starts to dry around the edges. After it’s done you can sprinkle it with chives. Most people like it with ketchup or even mayonnaise on top, I like it with both. It is the mushrooms, as they are a fungus and have alkaloids, if the mushrooms are good quality and quantity they sometimes do for me. Crazy dreams, hold on tight Dorthy because Kansas is going bye-bye. Polish zapiekanki are great, and I really love them. Nevertheless, in many restaurants like even Szfarnia 10 in Gdansk, we can also enjoy refined cuisine. Surely it includes tartare of cod or delicious seafood and even because of them we should go to Gdansk. I visited Krakow a couple years ago and absolutely loved the cheap eats. My girlfriend and I gave up our gluten intolerance so we could try the Zapiekankas. It was well worth it. They were amazing. We went to Plac Nowy two or three times. We also ate a ton of pierogies at a little place on Bonerowska. We can’t wait to go back. I’m curious though, there are many different windows (vendors) at Plac Nowy. Are they all different? How would you ever decide which vendor is the best? I see that Endzior is very popular but we never ate there. We sampled the other vendors. Shorter lines were better for us. The pirogies vary in quality, but there are a few places that are better. I did like any milk bar, as they are made from stratch in the back and are cheap. Did you try the ones by Alma the supermarket? The best are homemade they take less than an hour to make. Previous PostPrevious Are Polish people negative?